A central feature of Jennes Carrosserie’s new 49,000-square-foot (5,000 sq. 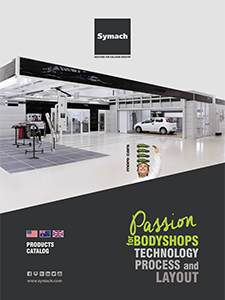 m.) body shop in Belgium, which opened in October, is Symach’s FixLine System. Jennes Carrosserie is part of the Jennes family business, which includes two additional body shops and four car dealerships that specialize in Audi, VW and Skoda. “Due to growing demand from our customers, we decided to open a new location that utilized the most revolutionary techniques in body work while applying the latest in energy-saving methods,” said Rudi Jennes, who owns the company with his brother Jan. “We called upon the renowned company Symach for the shop’s infrastructure. As a pioneer in ‘Smart Repair’ and ‘Day Repair,’ we felt Symach’s patented technologies in the field of fast drying paints would allow us to set up a state-of-the-art body shop.” The new collision repair shop expects to repair 40 vehicles per day with the new equipment, which includes: two FixLine conveyor KombiTron, two FixStations, 12 robots for drying paint, a professional Vacuum Sanding System, two paint mixing rooms, a MultiBox for the fixture, two complete Conveyor Car Movers, car-lifts and a professional Symach Light System PowerLight. “Symach has designed a specific layout and process for Jennes Carrosserie,” said Osvaldo Bergaglio, CEO of Symach. “Our company’s Drytronic technology and automated FixLine process will enable the collision repair facility to increase the quality of repairs, be more efficient and drastically reduce touch time.” Drytronic technology is based on Symach’s patented generator that operates based on a catalytic chemical reaction between hydrogen and oxygen, using natural gas or LPG (liquid propane gas). The chemical reaction generates different temperatures that produce an electromagnetic wave spectrum that can easily dry all types of paint. Bergaglio said the technology is used in conjunction with a Symach robot and laser sensors and significantly reduces drying time. By using Symach’s FixLine process, Bergaglio said Jennes can expect to reduce the current cost of repairs around 20% and touch time will be reduced to 1.5 days on average. By utilizing an optimized vehicle flow, he said this will increase weekly production from 80 to 200 repairs per week. Symach began installing the new equipment at Jennes Carrosserie in mid-March. Following the installation, training was provided for all of the technicians and managers, so they could become familiar with the new process and Symach’s Drytronic technology. Jennes also worked closely with BASF during the installation and training. Earlier this year in July, BASF’s paint engineering team tested its Glasurit and R-M paint lines on the DryTronic system at Symach’s Future Center in Bologna, Italy. “We obtained official approval from BASF to use the company’s products with Symach equipment along with approvals from AkzoNobel, Sherwin-Williams, Axalta and PPG,” said Bergaglio. “We have been very impressed with BASF’s excellent color competence and the continuous support of Symach and BASF to ensure a smooth start-up, so we can boost efficiency and optimize profitability,” said Rudi. The Jennes business got its start more than 60 years ago when Guillaume Jennes set up a garage adjacent to his home in Boortmeerbeek, Belgium where he primarily repaired Volkswagen vehicles. As the business expanded, Jennes decided to open his first car dealership in 1962 in the same area. His sons, Rudi and Jan, worked at the company from a young age and eventually began managing the family business, which now includes 200 employees. Rudi and Jan first learned about Symach equipment eight years ago from a client. “We ordered the FlyDry equipment for one of our locations and have been very impressed with it,” said Rudi.